The security at Metro stations and inside the trains has been tightened in wake of the high alert in the Capital. While the security guards at stations have been keeping a strong vigil, the movement of commandos on the station has also been increased. 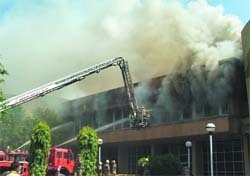 A major fire broke out at the conference room of pavilion number 6 at the Pragati Maidan complex today morning. Farmers from Kherpur and some other villages organised a demonstration in front of the GNIDA office against the acquisition of Abadi land. The Municipal Corporation of Delhi (MCD) today took the responsibility of initiating necessary steps to curb bird menace in areas around Indira Gandhi International (IGI) Airport. Supratim Dutta, 23, was discharged from the All India Institute of Medical Sciences (AIIMS) today, 18 days after a five-foot-long iron rod had pierced through his body in a road accident. Delhi unit of the Bharatiya Janata Party (BJP) has demanded that the state and the Central governments should make stringent provisions for the punishment of persons accused of carrying out terrorist activities. Creating a case of environmental disaster, at least 1,000 old trees are slated for felling by the authorities at Delhi University to re-haul a sports campus ahead of the Olympic Games 2010. Students and teachers alike are appalled over the situation and many have sent their written protest to the vice-chancellor. Rajesh Vedvyas has taken over as the managing director of Indraprastha Gas Ltd (IGL), the sole supplier of Compressed Natural Gas (CNG) and Piped Natural Gas (PNG) in the Capital. Chief Minister Sheila Dikshit today inaugurated a number of state-of-the-art facilities at GB Pant Hospital, a super-specialty hospital associated with Maulana Azad Medical College, here. The Delhi High Court today issued notice to Delhi University after St. Stephen’s College alleged interference in its affairs over appointment of a full-time principal. The Central Bureau of Investigation (CBI) has arrested two persons for allegedly impersonating as candidates chosen to be kitchen assistants at the All India Institute of Medical Sciences (AIIMS). Water is becoming a scarce commodity in Delhi that is home to some 16 million people and the crisis is going to worsen in the coming years, leading to more conflicts and pollution, warns a new study. As a direct fallout of the changing lifestyle and modern day dependence on computers and other communication aids, many people are now falling victim to vertigo, which in itself is a minor ailment, but can often lead to serious and even fatal consequences. After two of the four terrorists, linked with Ahmedabad terror strikes, were reported to be from Ghaziabad, the Ghaziabad administration and police have swung into action. But the identity or address of Ghaziabad terrorists has not been confirmed yet. The Indian Youth Congress today reconstituted its Faridabad unit in which there are eight vice-presidents and a dozen general secretaries. “Computers have increasingly become a medium of communication. Even terrorists and criminals are using computers to strike terror. Hence, we need police officers who are not only computer-savvy but are also able to investigate crimes committed by the use of computers,” said Y. S. Dadwal, commissioner of police, Delhi. A history sheeter wanted in 11 cases was arrested by the Surajpur police with 5 kg opium (doda) on Monday night. A police patrolling team during night nabbed two history sheeters. Varinder alias Kulwah was over-powered by policemen while his companion slipped away in darkness. Raids are being conducted to nab his accomplice also. A Kanwaria was killed and another critically injured by a speeding truck near Samaypur Badli village in east Delhi this afternoon. The CISF soldiers manning the security at the stations could be seen moving around with the dog squad and frisking people on slight suspicion. “We are not taking any chance. Every nook and corner of the station is being watched and any suspicious person is being stopped and questioned”, said a CISF jawan. The movement of security personnel inside the train has also been increased and people are being asked to open their luggage. “Although it is not possible to open the luggage of every single individual but we are not hesitant to ask in case we smell anything suspicious”, said a police official. Railway stations in New Delhi and Old Delhi are also undergoing strict monitoring of people movement. All the entry points to the station apart from the main entrances have been shut so that nobody could escape the eyes of the camera. Extra metal detractors have been put up for full proof security while men in uniform near them do not hesitate to question anybody without luggage or appearing suspicious. “Although, it is irritating at times for these security personnel to question unnecessarily, but I guess there is no other option,” said Subba Ram, a visitor at the New Delhi railway station. The fire broke out at 7 a.m. It could be extinguished only around 11 a.m. More than 20 fire tenders were deployed to control the situation. No casualty or injury has been reported. “We got the call at 7.05 a.m. It took us more than four hours to control the fire that had spread to more than 1,600-sq metre,” said a fire official. The cause of fire is yet to be ascertained. Officials of the International Trade Promotion Organisation (ITPO), who rushed to the spot as soon as they heard about the mishap, could not tell about the exact losses. However, they said that some woodwork was being carried out in the pavilion. As a result, the fire was accentuated. Certain halls in Pragiti Maidan are being used for the salaried class to file their Income Tax Returns. Not many people were present in the vicinity as the fire broke out in the early hours. After the fire was controlled, the people were able to file their returns as usual. During the agitation, which extended for over a couple of hours, wooden fence and some flower pots were damaged. 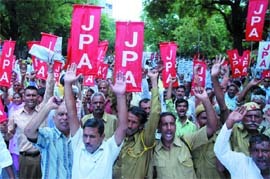 When after a considerable time, no official came out for talks, angry farmers tried to gatecrash into the GNIDA offices. Slogan shouting farmers then started pushing the security guards and tried to enter the office complex by scaling the boundary walls. However, after the arrival of the police, farmers finally got to meet additional CEO of the GNIDA Sudhir Singh. The farmers presented their demands before Singh and handed over a memorandum to him. They warned the authorities that if their demands are not met by August 4, they will start a fast until death from August 9. The farmers said that if despite this, the GNIDA takes no action they will start satyagraha along with their families on August 15.
least one member from each family giving land should be given employment. A delegation of senior IGI Airport officers have met standing committee chairman Vijender Gupta to talk about the danger of aircraft accidents posed by birds. The Corporation zeroed down on seven locations around the airport where animal and poultry waste are dumped illegally. These wastes have led to an increase in the concentration of birds at the locations. Gupta assured that the MCD and the Delhi Development Authority (DDA) would jointly carry out cleaning operations at storm water drain in Dwarka Sector — 8. The delegation said that nearly one lakh birds are attracted towards Ghazipur waste dumpsite. The airport authorities have deployed 25 bird chasers per shift to cover the three runways. The number would be increased to 50 soon, he assured. High intensity crackers are being used for scaring away the birds. Scarecrow devices are also being deployed. The number of polycarbonate spikes on the runway approach lights would be increased from 300 to 1,000. Silver flutter strips are also being installed at runways. Doctors at Jaiprakash Narayan Apex Trauma Centre said that he could have been discharged a week ago but they were monitoring the wounds and skin loss he suffered in the accident. Catching attention outside the country, Supratim’s case could be covered by Ripley’s Believe it or not, a show that covers bizarre events from across the world. Doctors have also provided Dutta’s story to the New England Journal of Medicine along with photographs of the operation. Supratim had gone through four painful hours of struggle before he was put on anesthesia. “The pain was excruciating. 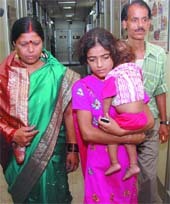 But by the time I reached the hospital, I was exhausted and had no energy to cry even,” Supratim told press. The iron rod entered Supratim’s body from the front when his car rammed into material piled at a metro construction site in South Delhi. However, he managed to phone his family and was rushed to AIIMS, where one of the most unique surgeries was performed on him. “When he was brought to the hospital, we saw that an angle had pierced through the upper part of his abdomen and come out of the chest on the left side of the body,” said Dr MC Misra, head of the department, AIIMS Trauma Centre. The doctors said that the medical miracle was possible because the rod had missed his vital parts like kidney and heart. Delhi BJP president Harsh Vardhan has demanded that terrorism cases should be heard on a day-to-day basis in special courts that have the power of High Courts. “By doing so we can demoralise terrorists. The Central law ministry, home ministry and the Delhi government should take steps to constitute such courts in the Capital,” he said. Harsh Vardhan said that the transistor bomb blast case of 1985 is still being heard in the court of additional district judge. The accused persons have not been punished in 23 years. He alleged that it was due to Congress party’s vote bank politics that terrorists like Afzal Guru were still alive. “Terrorists, naxalites, maoists, Ulfa militants, Gurkha extremists have established their centres in 400 districts of the country. 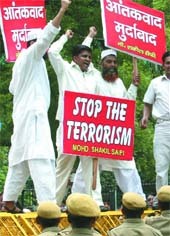 The UPA is soft towards terrorists to save its government,” he alleged. Over 200 trees have already been cut down. A tree plantation drive is also being executed on campus, but experts feel that this is not being managed properly. Environmentalists inform that transplantation, or re-planting a full-grown tree is not a very easy job. One has to ensure that the roots don’t dry up; that the site where re-planting is be done is conducive to growth and that uprooting of the tree is done with utmost technical supervision. Large cranes and specialised equipment are necessary for carrying this out. Also, the presence of experts to oversee the whole process, in which everything from the cutting of the tree and the pruning of the roots to identifying suitable soil for re-planting is carried out, is necessary. “When we went to check how the transplantation work was going on, we were shocked to find that masons were carrying out the job,” informed Govind Singh, a Ph.D. scholar in DU and head of an environmental trust called Delhi Greens. Rajesh Vedvyas took over the reins of IGL from Om Narayan, who has been repatriated to GAIL (India) Ltd, from where Vedvyas would superannuate on July 31. She was accompanied by health minister Dr. Yoganand Shastri, MLA Tajdar Babar, her principal secretary and principal secretary (health). She dedicated the modular neuro surgery operation theatres, epilepsy monitoring unit, a separate arrhythmia centre, surveillance system, bio-medical waste management (microwave), effluent treatment plant, library, resident doctor’s hostel, cafeteria and kitchen to the Capital-city. Dikshit said her government had strived hard to provide world-class patient care in this super-specialty hospital, which is situated in the centre of the city and has been catering quality healthcare not only to the residents of Delhi but also to a large number of people coming from other states. She said Delhi hospitals had to cater to a large number of patients everyday, including patients coming from other states. She expressed the confidence that new facilities would enhance prestige of the GB Pant Hospital and go a long way in ensuring better and dependable healthcare. She also stressed the need of proper maintenance of advanced medical infrastructure. A state-of-the-art high quality modular (pre-fabricated) neurosurgery operation theatre also became operational today. This is the completion of first phase of neurosurgery modular OT-ICU complex with three modular theatres and 19 ICU beds (total six neurosurgery theatres and 33 ICU beds being created with high technology equipment for advanced neurosurgical procedures. Dedicated operation rooms exist for neurovascular procedures, steriotactic surgeries, functional neurosurgery and epilepsy surgery as well as image guided neurosurgery for deep seated brain and spine lesions. This is the first epilepsy monitoring unit in the Delhi government hospitals to offer this advanced epilepsy care. A dedicated space has been allocated for the purpose and it has five video monitoring units. Epilepsy is the most common neurological disorder. The prevalence rate of epilepsy in India ranges from 2.2 to 5.7 per 1000 persons. Around 20 per cent of these are medically refractory (not controlled with medical management alone) and require surgical treatment. Considering this around 1,110,000 people will have medically refractory epilepsy. Nearly half of the patients with refractory epilepsy would be potential cases for epilepsy surgery. However, there are very few centers across the country, offering epilepsy surgery. The arrhythmia centre offers updated treatment facilities for both slow and fast heart rhythm disorders. A division bench headed by Chief Justice Ajit Prakash Shah and Justice S. Muralidhar issued notice to Delhi University to reply by Friday. St. Stephen’s had approached the court after it received a letter from Delhi University on March 20 directing the college to provide a list of candidates who had applied for the post of principal. The university, citing a clause of the university ordinance, said it would complete the selection procedure and then inform the college recommending the name of the selected candidate. The college opposed the move by the university contending that they are a minority institution and have always selected principals on their own. “Any interference from the university will be infringing our fundamental rights,” the college alleged. On July 4, the court asked St. Stephen’s to appoint a full-time principal in the college as early as possible. The bench was hearing a public interest petition filed by R.K. Malhan, a former faculty member of the college, through his counsel Sachin Datta. AIIIMS in its complaint to the CBI in July 2007 alleged that two unknown men were impersonating as Naresh Kumar and Satish Kumar, who were selected for the post of “masalchi/bearer” in 2003. “The duo joined in place of genuine candidates by impersonating them. However, they ran away when the real Naresh and Satish made queries regarding their appointment letters,” a CBI official said. The game was up this July when the CBI arrested Panchdev Chouhan and Ram Dulare Chouhan on July 22 and July 24 respectively. “The nation’s capital is perpetually in the grip of a water crisis, more so in the dry season, when the situation gets particularly worse,” says the study by the Associated Chambers of Commerce and Industry (Assocham). “The water crisis in the Indian capital is set to take a turn for the worse in the long run, leading perhaps to more water-related conflicts,” adds the study, a copy of which was made available to IANS. The study also points out that despite the current shortage of water, the city also sees huge wastage of water, estimated at over 40 per cent, against 10-20 per cent in cities of other developing countries. “The distribution losses are due to leakages in a network of nearly 9,000-km-long main water supply chains and theft through unauthorised connections,” says the chamber’s secretary-general D.S. Rawat. “The conservative pricing of resource and associated services - along with non-metering of 23 percent of the connections - also discourages a wise use of the available resource,” Rawat points out. Recently, a motorcyclist suddenly dashed against a moving bus near Nehru Place and suffered serious injuries. He was rushed to the hospital. When he recovered from his injuries and was able to talk, he told the attending doctors that the accident was the result of the fact that he suddenly had a bout of dizziness and could not control his movements. Going into his medical history, it was discovered that the patient had been having these attacks for quite some time but generally ignored them, blaming them on fatigue or the general heat and dust of the city. Vertigo is a classification under dizziness that results in a spinning sensation or illusion of movement and arises from disturbances in the vestibular system or neural structures such as the cerebellum, the brain stem, and the pro- perceptive fibers along the spine. Many people who experience dizzy sensations often do not have vertigo, but instead, are found to suffer from common lightheadedness. “Dizziness and vertigo are unpleasant and common conditions. Although the causes are not usually serious, sometimes the consequences can be serious like in the accident case. That is why it is important for the sufferers to get a thorough medical examination,” says Dr. R S Mishra, consultant physician, Max Super Speciality Hospital, here. Most people have experienced that vague unsteady feeling, usually after standing up too quickly, called dizziness. And many have had that unpleasant sensation of the room spinning around, often associated with nausea. Doctors distinguish between the two symptoms, calling the first dizziness and the second vertigo. This is a useful distinction in that vertigo is more likely to point to specific problems with balance mechanisms whereas dizziness can occur because of a wide variety of reasons, say doctors. Dr. K. D. Gupta, senior ENT specialist, Sir Gangaram Hospital, says, “Vertigo sufferers should avoid alcohol, coffee, chocolate and other foods that are high in sugar or salt. In Ghaziabad and Noida, police has started checking the vehicles and passengers in trains and buses. SSP Deepak Rattan said he could not contact the Udaipur police in this connection. The two terrorists were held in Udaipur. Members of national and international terror groups are known to have taken refuge in Ghaziabad in the past. However, the local police has failed to nail the members of these terror groups whose networks have proved to be stronger. The history of terrorists’ activities shows that by exploding bombs on cycles, in trains and buses, they have killed a large number of people by using hideouts in the Mahanagar. The killers of Punjab’s former Chief Minister Beant Singh had taken refuge in Nand Gram area of Ghaziabad, but the local police could not get even a wind of it. Later, when the Punjab and Delhi police teams combed Nand Gram, the local police came to know about the militants. Bela Noose and other British citizens were kept in a hideout in Mussori police area after they had been kidnapped from Kashmir. Dreaded terrorist Abdul Karim, alias Tunda, had been active in this area for a long time. Pilkhua-based Tunda had come into limelight after a bomb explosion in Chhatisgarh Express. He had escaped before police could nab him. Tunda, an expert in bomb-making, had reportedly lost one of his arms while getting training in bomb-making in Pakistan. Meanwhile, the Ghaziabad police has raided a number of cyber cafes in the city in search of possible terror links. president of the district unit of IYC, Summit Gaur said that three block presidents have also been appointed. preceding executive committee of the district unit have been retained. Praising Chief Minister Bhupinder Singh Hooda, Gaur said that the present Congress government in the state was doing a lot of good work. The local unit of the IYC has done a lot to increase the party’s base in Faridabad. He named a number of blood donation camps, and other social works undertaken by the organisation. Dadwal was speaking at the valedictory function organized by Guru Gobind Singh Indraprastha University (GGISPU) for 100-odd investigating officers of Delhi Police and two officers of Central Bureau of Investigation (CBI) who have successfully completed their six-week training programme in ‘Cyber Crime Investigation and Computer Forensics’. Dadwal also announced that 100 more officers will undergo similar training at GGSIPU. Officers of Delhi Police, who are of the rank of sub-inspector, inspector and assistant commissioner of police, undertook this training programme in two batches held during April-May, 2008 and May-June, 2008. The first batch of participants was given certificates by Dadwal. The training programme in Cyber Crime Investigation and Computer Forensics was conducted after considering the massive increase in the number of crimes related to information technology and cyber space, and hence it has become crucial for the police force to be well-equipped to investigate and combat crimes using technology. The first four weeks of the course provided inputs in computer hardware. According to SP (rural) Babu Ram, the two were seen moving about suspiciously during night. When asked to stop they tried to escape. After a brief chase, Varinder was caught while his accomplice managed to slip. The police has recovered 5 kg opium (Doda) from Kulwah, Babu Ram said. Kulwah, a resident of Sakipur is wanted in 11 cases including those of loot, dacoity and kidnapping. His accomplice, Sonu, is a native of Dujana. The deceased has been identified as Puneet Goyal (20) while the injured person is Bansu Ram (50). He has been admitted to Babu Jagjivan Ram Hospital where his condition is said to be critical. The duo was returning from Haridwar on foot after collecting holy water of the Ganga. They belong to Haryana. The police has registered a case against the unknown person while efforts are being made to arrest the truck driver who managed to flee the accident spot. With the arrest of four persons, Jitender, Virender, Vikas Viduri and Ravi, the east district police has claimed to have solved the murder case of one Sunil Bhati. The body of the deceased was recovered from a bus stop near Kotla village on Saturday. Detailed enquiry regarding Sunil’s movement on the day of incident was done. It was revealed that he often visited his friends, who were residents of Gokulpur village and consumed alcohol there. Surveillance was kept over the alleged accused and they were apprehended in Ganga Vihar area. During interrogation, the accused revealed that one Saria Pahlwan’s son Narender was killed in an encounter with a rival gang a few years ago. The alleged accused suspected Sunil to have associated with the rival gang and helped in getting Narender killed. On the night of incident, the alleged accused offered a lift to the deceased in their car. Near Kotla village bus stop, Ravi fired a shot at Sunil with his unlicensed gun. Ravi then handed over the pistol to Jitender, who fired another shot at Sunil. Police also recovered the weapon of crime, a Russian pistol and three live rounds. The Vikas Puri police has arrested Deepak and Vinod, notorious vehicle thieves of the area involved in several cases of theft and car jacking. Four stolen motorcycles and a Maruti car have been recovered at his insistence. The duo was arrested on July 25, when they tried to run away after seeing a police picket. The beat staff, showing presence of mind, acted fast and overpowered the bikers. On inquiry, it was learnt that the bike on which they were travelling did not have a number plate and was stolen from the Vikas Puri area on July 7. On sustained interrogation, they revealed that they were involved in many cases of car and motorcycles theft and purse snatchings under various police stations including Vikas Puri, Paschim Vihar, Nangloi, Mayapuri and Patel Nagar. They also disclosed that they have two more partners namely Gulfam from Uttar Pradesh and Mukesh from Uttam Nagar in Delhi. Both are reportedly absconding at present. One Maruti car, one Tata Tempo and at least four other stolen motorcycles are in the possession of Gulfam and Mukesh. With the arrest of the accused, the police claim to have solved 10 cases of vehicle theft.